Beautiful chrysoprase and moissanite engagement ring handcrafted in sterling silver. This chrysoprase engagement ring is 6.2mm wide at the top and tapers down to 4mm at the bottom of the shank. 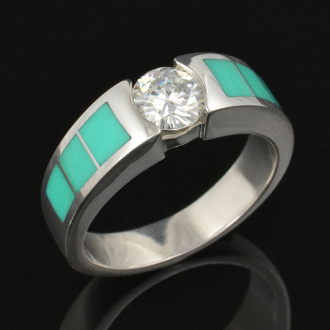 The engagement ring has 3 pieces of green chrysoprase inlaid on each side of a center set Forever Brilliant Moissanite. The .68 carat round moissanite is set almost flush, giving the engagement ring a sleek low profile. Moissanite is a laboratory created gemstone with more brilliance than a diamond and is almost as hard. It is an affordable and conflict free alternative to diamond without sacrificing beauty or durability. The moissanite comes with a limited lifetime warranty and certificate of authenticity from Charles and Colvard.